Jody Strausser earned his master's degree in computer science and worked for a number of years as a defense contractor in the modeling and simulation industry. One day, he received an offer he couldn't refuse. Tidewater Community College (TCC), Norfolk, VA, wanted him to set up a two-year modeling and simulation program, and his interest in working with students and exploring the field further led to a major career change. Strausser is now assistant professor of modeling and simulation at TCC, where he set up not only the two-year degree associate degree program, but also a career study certificate for working professionals seeking to advance their skill sets. "I was creating this program when the opportunity to add an advanced modeling and simulation laboratory came along," he said. "We created this laboratory for students who were new to basic programming and who were going to create virtual environments that could be experienced in the classroom." Using various programs, such as Presagis Creator 3D software for real-time 3D modeling and simulation and Vega Prime toolkit for 3D application development and deployment, plus a combination of other free (Game Maker, Blender) and commercial software, Strausser readied his students for learning the art and science of modeling and simulation. The modeling and simulation industry offers a relatively large amount of jobs, especially in the areas surrounding Washington, DC. Emergency management, defense, gaming, and aviation are just some of the industries that require the skills. Strausser teaches everything from how to develop a flight simulator to game development to give them the skills to enter the workforce. An ideal advanced laboratory, however, needed excellent visualization technologies to best show the students' work and give them a feel of how their designs will work in the real world. "The idea was to make it as real and hands-on as possible," he said. "When creating a virtual environment for training purposes, you need as much realism as possible. In order to train effectively, the visualization needs to be and act like a real-world environment." So he set up a huge screen--a 27-foot, 3:1-aspect ratio, ceiling-recessed electronic screen from Da-Lite--that takes up an entire wall of the laboratory. "Ordinarily, it would take three expensive highly detailed projectors that have to be aligned properly to get one massive image on the screen," he said. "But we didn't need to buy those expensive projectors." Strausser, instead, went with Mersive Technologies' Mersive Desktop, which combines the images from three off-the-shelf projectors (TCC's are from Canon) into one large, seamless image. The program is run from a desktop or laptop computer, and it can project any content that can run on the computer. The trick, though, is that Mersive Desktop uses its own software and a camera to calibrate the images, reading specific feedback patterns from the projectors, feeding the information to Mersive's server software, and the software automatically aligns the projectors (in the software). It basically tells the computer how to "stitch" the projector outputs together to form a large, seamless display. "I started demoing the system last year and got the students excited about it," said Strausser. "Then I started using it in class. The key component to it is the fact that it gives them the drive to make their environment as detailed as possible and pushes them to be sure their programming is correct." Strausser said that when viewing modeling and simulation projects on a small computer screen, it is easy to overlook some of the details. With the large screen, students realize their work will be seen by the entire class, so they want their work to be precise. "With projection, students who created a tank, for example, may see that the tank is actually floating above the ground. On a 27-foot screen, those details really stick out." The technology also assists collaboration. "One student may have designed a tank simulation and another an airplane," he said. "They have their finished models on their own computers, they bring together various images and apply physics to the models to make them fly or move over terrain, and maybe even show the controls of the vehicles. Once that is up and running, they work as a team to bring together the components, one driving a tank, one flying an aircraft. 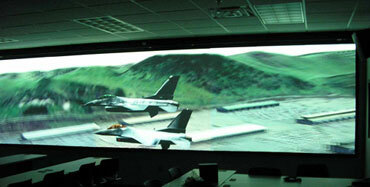 We can integrate those two potentially different environments into one overall system so that, when projected on the 27-foot screen, they appear in the same virtual environment, with one person driving the tank and another flying the aircraft on the huge screen." The full visual field not only pushes students to do their best work, but it also engages them in ways small screens cannot. "I can see the level of excitement go up," said Strausser. "That is the main difference from when we started the programming and didn't have the advanced modeling and simulation laboratory and when we did." He said students are now saying they want to get their projects on the big screen and that is their reward for doing well. As for Strausser, the lab and his teaching are paying off. "This is a very exciting project," he said, "otherwise I wouldn't be doing what I am doing. I'd still be in industry."